Acariasis, also known as mite infection, is not a widespread problem in domestic pygmy hedgehogs, but if your pet exhibits abnormal scratching with bare patches of skin, it may be due to mites. Hedgehog mites look like tiny white specks at the base of the quills and on the skin. You may also see the bugs on your pet’s bedding. A quick way to check for mites is to stand your hedgehog on a sheet of black paper and wait for her to scratch. Mites are much easier to see against a dark background rather than trying to inspect a hedgehog’s already irritated skin. Mites are difficult to see, but the symptoms they cause are not. Chronic scratching, quill loss and patchy, dry skin could be a sign that your hedgehog has mites. 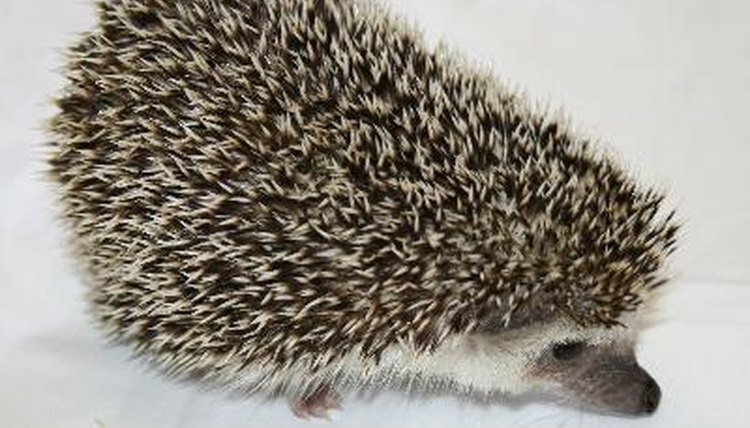 Hedgehogs lose all their baby quills between 8 and 12 weeks of age; this is the only time you should see excessive scratching and shedding as they grow new adult spikes. When quills fall out as a natural part of shedding, they come out clean and sharp at both ends with no residue. Quills shed because of a mite infestation often fall out with flakes of skin still attached to them. According to the "Manual of Exotic Pet Practice," there are at least three documented species of hedgehog mites. However, the Caparinia, Chorioptes and Notoedres species are not the same mites carried by cats or dogs. Mites pass from one hedgehog to another by contact, and although common in wild pygmy hedgehogs, pets are less likely to become infested if they do not go outside or come into contact with other hedgehogs. If you allow your hedgehog a little backyard playtime, there is the possibility she may pick up bugs and critters left behind by her wild cousins. Pygmy hedgehogs aren't common pets so there are no commercially available, hedgehog-specific medicines or parasite treatments in pet stores. Despite the lack of hog medicines, do not be tempted to try something created for guinea pigs, hamsters or any other small animal unless your vet tells you it is safe to do so. Some small animal treatments are suitable for hedgehogs, but a vet is the best person to ask for dosage advice. Never guess – you could do more harm than good by overdosing your hedgehog. Prevention is better than a cure, so check your hedgehog’s skin regularly. As with most anti-parasite treatments, only administer them with the recommended number of weeks between doses. If you are buying a new hoglet, ask the owner if the litter has previously been treated for mites as a precautionary measure in case you need to treat your pet at a later date.